Are you currently shopping for Hunterdon County Windows? Your Flemington window replacement project is one of the smartest ways to redesign your home. Do you need more light? Does your redesign include adding more windows to your house? Home owners like it when all their windows match. Replacing and adding windows at the same time does far more than change the appearance of a home. You can transform the entire atmosphere around a dwelling by opening it up with more windows. Seeing more of your garden changes the feel inside your home. Replacement window specialists can recommend a variety of possibilities to transform your home this summer. Have you seen how many window options are available to home owners? Do you know about the energy efficiency ratings on these newer products? Your windows can serve a greater capacity than ever before, thanks to new innovations. Looking good and providing energy efficiency appeals to home owners with older style windows. You can improve your property while recreating the living space that works best for you. Home owners work hard to fashion their living spaces to accommodate their style and taste. Purchasing a home doesn’t always guarantee a perfect fit. Home owners have a tendency to picture a prospective property based upon the possibilities it presents. You don’t want to be locked into a dwelling that cannot be improved. New windows are an easy way to begin transforming your living space. You create your living space so that you can enjoy it. Wonderful moments are always happening outside. Birds and butterflies appear randomly without warning. You deserve to see as much of the beauty surrounding you as possible. Have you heard birds calling but can’t see them through your old windows? Do you have a hummingbird feeder that can only be seen from a certain angle? You want windows that open the world outside in a grand way. How those windows open up to the world is entirely your choice. If you want windows that open out, casement windows are the perfect design for you. Hinged on either the right or left, they swing open, bringing more of the outdoors, indoors. A twist of the handle opens the window easily. If space is an issue, designers recommend windows that are wider than they are tall. They let in more light, giving a room the illusion that it is bigger than it actually is. Garden windows truly bring the outside in. Garden windows are made of four panels, which allow a lot of light. Put a garden window in the kitchen, and not only do you have a great view of outside, it can be a practical addition, too. Watch the kids at play, enjoy your view of your garden, and make a place for pots of flowers, or even herbs. A garden window is a great space for herbs to flourish. While a garden window works beautifully in the kitchen, bay and bow windows can do wonders to make a living room or bedroom brighter and more elegant. Like garden windows, bow windows offer a space for a flower pot or even statuary. Bay windows also let in lots of light, and have a more formal feel to them. 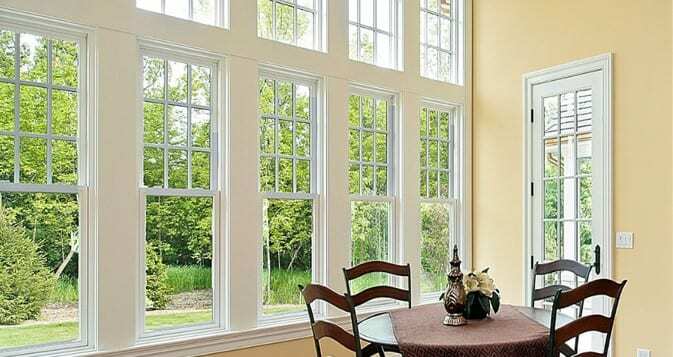 Double hung windows tilt for easy cleaning, and allow a great deal of air in. What better way to freshen your house, than by throwing open your new windows to the outside world? Whatever windows you are shopping for, a Flemington window replacement specialist can help you choose the perfect ones for your home.